Po-Rag, the festival of inviting families of girls of the village married off outside for a reunion, was celebrated with fun and merriment in Ghunasuti in Dhakuwakhona sub-division, seven kms south-east from North Lakhimpur town in the district of Assam. The festival, which is celebrated in every five years was organized in a three-day programme commencing from Wednesday. On the final day of the festivities an open session was held which was inaugurated by Khagen Payeng, principal of Miri-Jiyori College, Ghunasuti. In his inaugural address, Payeng said that Po: Rag was a post-harvest festival in which cultural troupes from other places were invited to interact and mingle with locals and invitation of girls married off to outside the village along with their families for a reunion and interaction. The open session was chaired by senior medical officer Dr Dambaru Dhar Pegu where the souvenir of the festival was released by surgeon Dr Prabin Mili. The session was also attended by Mising Durbre Kbang’s Ekalabya Gam, poet Jogen Taid and Bikhananda Mili. A seminar on Ghunasuti was also held on that occasion which was conducted by Ghanshyam Taid, professor of Dr Banikanta Kakoti College, Nagaon. Earlier on Thursday a symposium on youth hooliganism was held along with a drawing competition for the children. 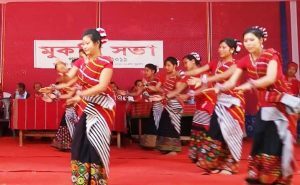 The three day festivity saw a confluence of colourful cultural extravaganza of the Mising community in Ghunasuti – a historical place immortalized by noted literature Rajanikanta Bordoloi in his epic ‘Miri Jiyori’, the first Assamese novel published in 1894.